An additional 3 to 5 inches of snow is possible this morning. The snow should come to an end by noon. 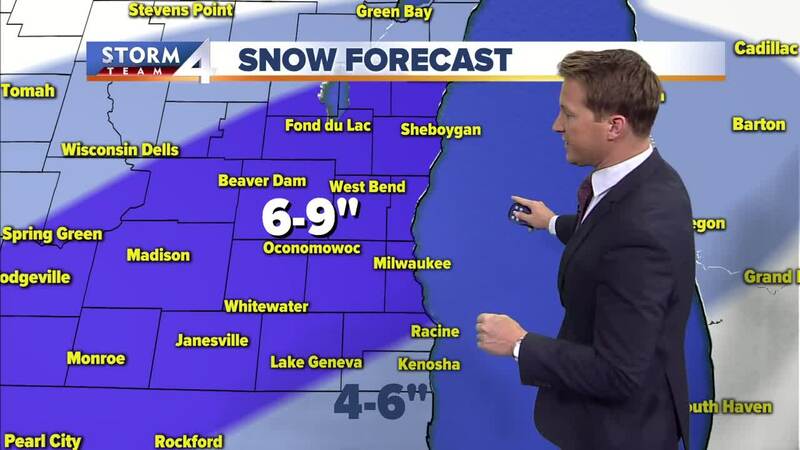 Total snow should range from around 5 to 9 inches for most of southeastern Wisconsin. Cold starts settling in again tonight. Lows will fall into the single digits for most of the area and the wind chill should dip below zero. The real blast of cold arrives Thursday night and into Friday. Temperatures Thursday night should dip well below zero. Wind chills may fall as cold as -25. Highs Friday will struggle to reach zero. TODAY: Snow Early. 5-9 inches total. High: 28 Wind: N 10-15 mph. TONIGHT: Mostly Cloudy and Cold Low: 10 Lake 6 Inland. Wind: W 10-15 mph. THURSDAY: Mostly Cloudy and Cold. Windy With Chance of Snow Showers. High: 20. FRIDAY: Partly Cloudy. Windy and Bitter Cold High: 2. Wind Chill: -25 to -15. SATURDAY: Partly Cloudy and Very Cold High: 7. SUNDAY: Mostly Cloudy. Ch. Snow Showers High: 14.